I’m not much of a tech savvy person so I’m still dumbfounded as to what happened with my deleted comments from the other post. After a lot of breathing exercises, I did email WordPress and am still waiting for a reply. I have a feeling that when I went to add the link to Sophia’s giveaway and pressed update, it must have deleted all my comments. If that is the case then it really was my fault and not WordPress’ fault. Like I said, I’m still an amateur at this blogging thing and still learning the ropes. I think everything we do on the computer should have an “undo” button (for computer 101 idiots like me) so that if we accidentally do something we don’t want, we can push that button and well, “undo” it. I’m not mad that people can’t see my comments. I’m just mad that you guys took the time to leave a comment and they all got deleted. Of course Jessie, being the sweetie that she is, went back and actually recommented (is that a word?). Thanks for doing that girl, you rock! Anyways, I’m determined to get to the bottom of this. 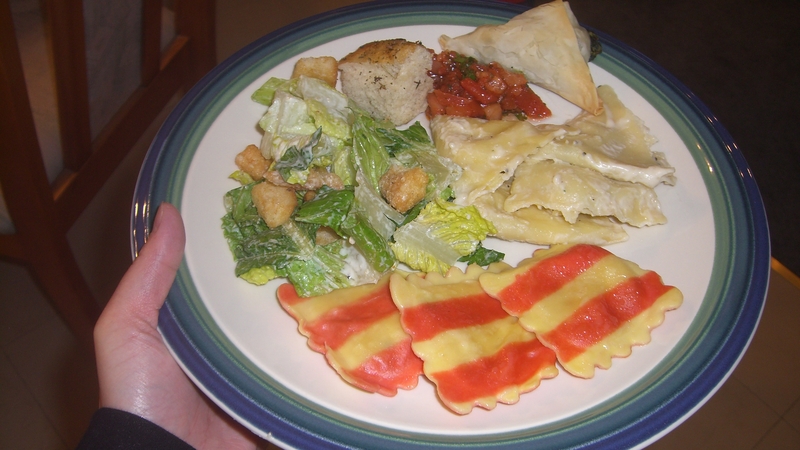 I haven’t put up a recipe in a while so this post will include two dishes that we had for dinner. 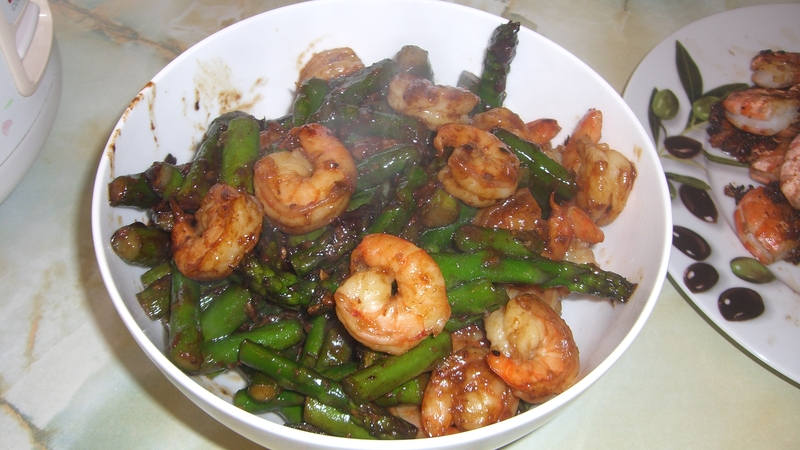 The first one is stir-fried asparagus and shrimp with oyster sauce. Cut asparagus into one inch lengths. Heat the cooking oil and chopped garlic in a wok or pan on high heat. 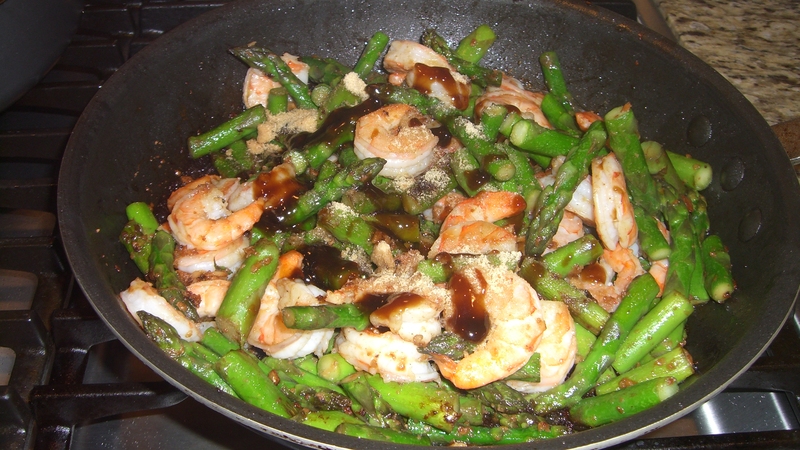 When the garlic turns golden brown, throw in the asparagus. 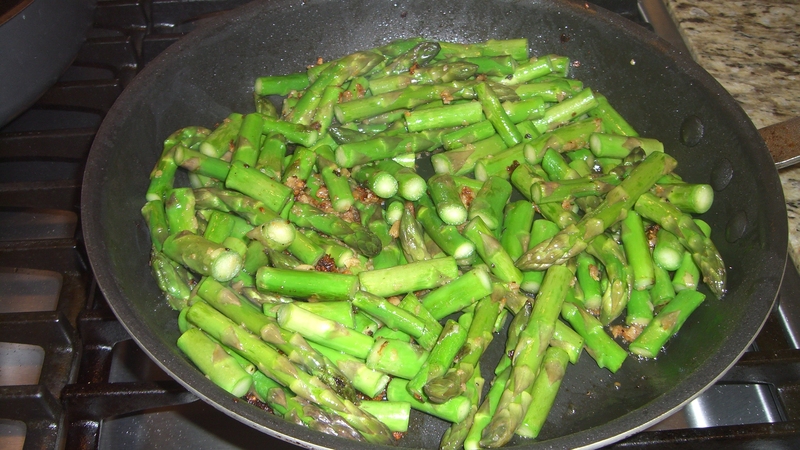 Stir and toss the asparagus around for about 2 minutes. Add cooking wine. Cover for about 3 minutes. Add in the shrimp. Stir around until the shrimp start to turn pink/orange. Add in the rest of the ingredients. Toss and stir until all the shrimp turn pink/orange. 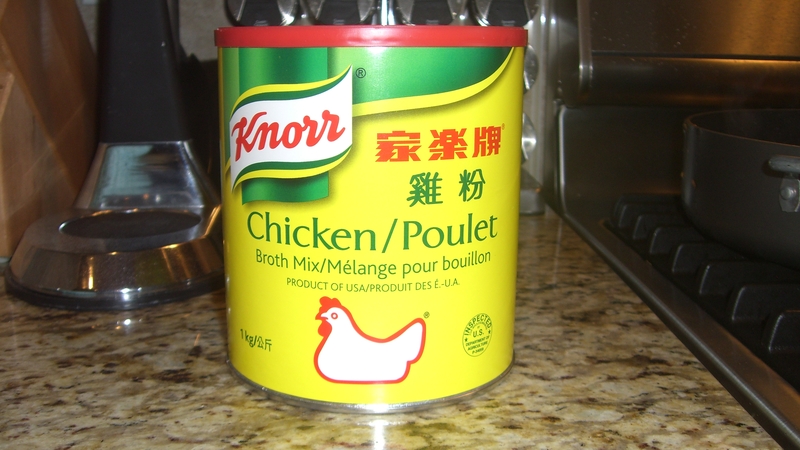 This is the chicken broth powder I like to cheat with use sometimes. 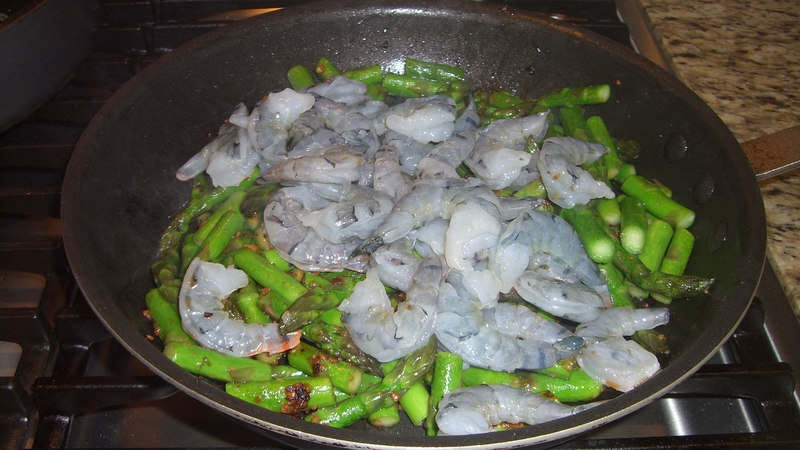 This next dish is a stir-fried salt and pepper shrimp. Heat up the cooking oil and chopped garlic in a wok or pan on high heat. 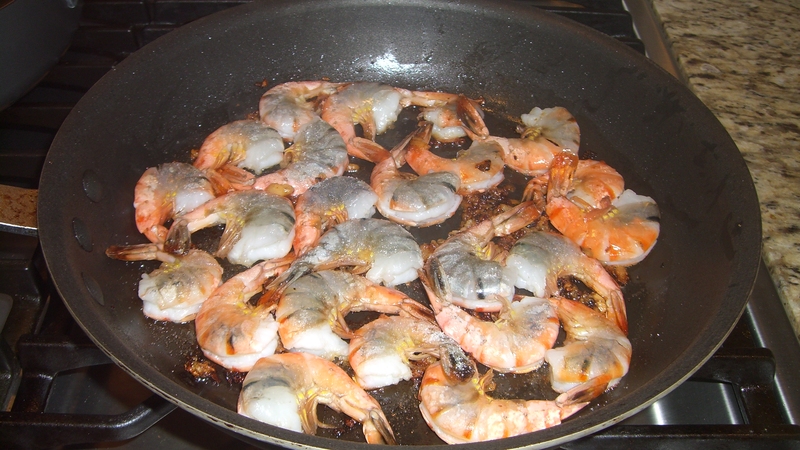 When the garlic turns a golden brown, lay the shrimp down in the pan. Cook shrimp until the bottom side turns pink. 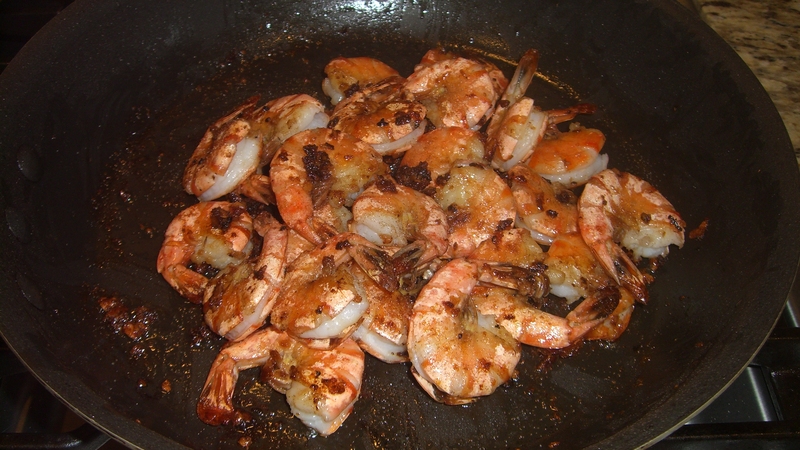 Sprinkle the top (uncooked) side of the shrimp with one teaspoon sugar and 1 teaspoon spice salt. Flip and repeat on the other side of the shrimp with the rest of the sugar and spice salt. This is the brand of spice salt that I used. 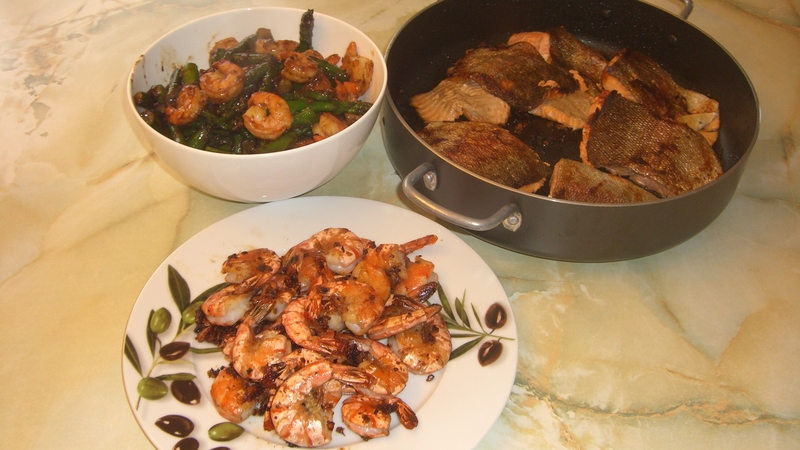 Once the other side of the shrimp all turn pink, give the shrimp one last toss and stir to mix the ingredients. If you want you can definitely add some red chili and some shallots to this dish at the very end for colour. I didn’t because of my kiddies. 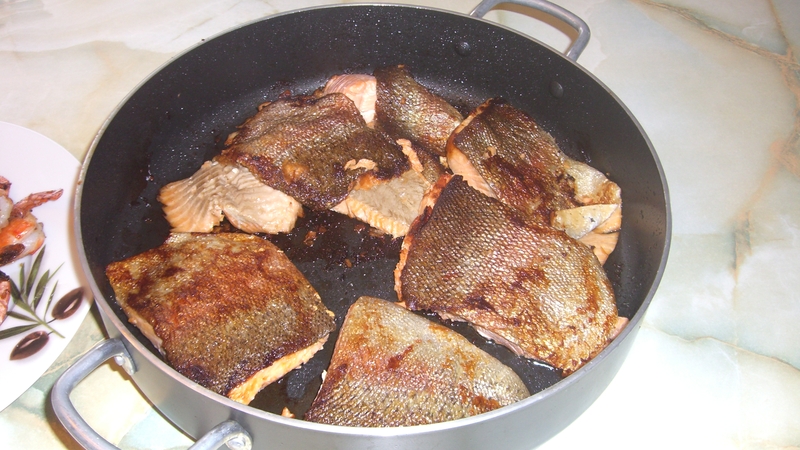 We also pan-fried some trout with garlic and cooking oil. 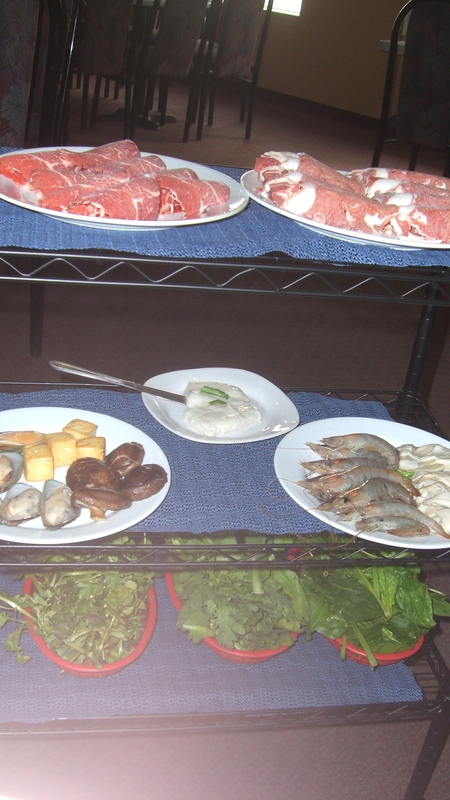 Three dishes with some white rice and dinner was served. Kayla seemed to enjoy dinner. But where’s her little brother? 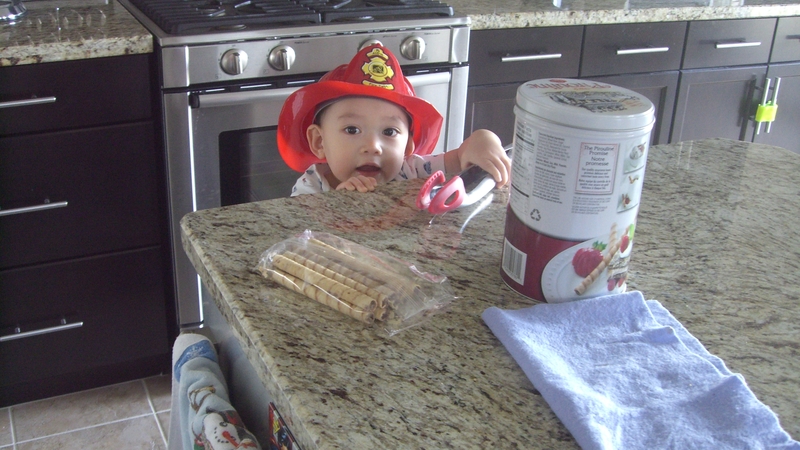 Getting into trouble as usual….sigh. Hope you enjoy these dishes if you do decide to make them. Before I go, Sophia at Burp and Slurp and Michelle at Lucky Taste Buds are having some giveaways. Have a great Wednesday everyone! Ok first of all, I have to apologize to those of you who left me comments on my last post: Like Lynn Chen, My Parents Rock. Sorry Ameena, Denise, Stella, Jessie, Sophia, Leah, Cindy, Kristen, I don’t know what happened but WordPress decided to delete all your comments. WTH WordPress??!! Has this ever happened to any of you? AAARRRGGGHHH! I’m so mad! Breathe in…breathe out….breathe in…breathe out. Haha…but not really…grrr. Now I gotta go see what’s going on and why it’s deleting my comments. I hate technology sometimes. Oh and if anyone does decide to comment and it gets erased again…please let me apologize in advance until I figure out what’s wrong. By the way, the lovely Sophia at Burp and Slurp is having an awesome giveaway. Go check it out! 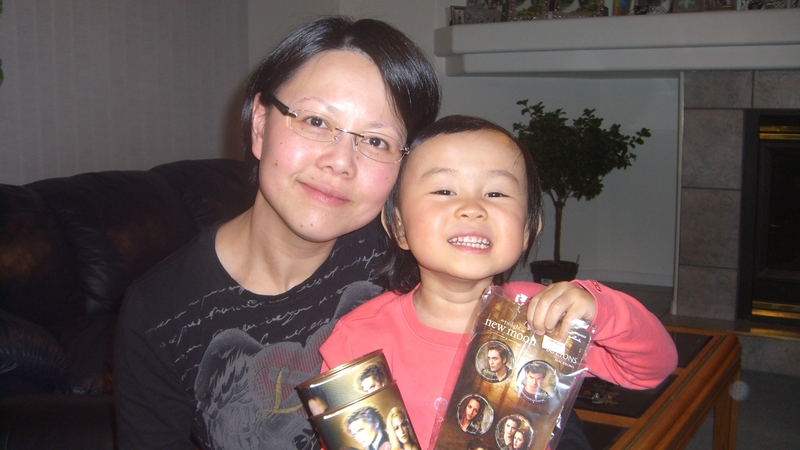 Like Lynn Chen, My Parents Rock! Thank you for the wonderful comments on the last two posts and for taking the time to share your thoughts, experience, and opinions with me. I enjoyed reading what you had to say about blogging and agree with some of your thoughts. I’ve only been blogging for about a month now and it’s nice to get thoughts from more experienced bloggers. I know I should totally take advantage of my Mom’s salon but if you know me in real life, you’ll know I’m not much of a girlie girl. I’m one of those girls who will only put on make-up and dress up when I really need to, like attending a formal dinner or a birthday party. Most of the time you’ll see me in a superman t-shirt (I own like at least 20 different ones…haahaa) and either sweats or jeans and runners. I’m all for comfort over trying to look pretty. I know my hubby and friends will definitely concur to that. I mean come on I’m married with 2 kids, who’s there to impress? I know it’s a little cliché but I definitely agree that true beauty comes from within! Anyways, on with my next post (sorry for the rambling). So being the freeloader off my parents that I am, I think it’s only right to take them out to dinner every so often. They ask me why I keep taking them out to eat and I tell them it’s cause I love to eat so much. Really it’s cause I love spending the time with them but I ain’t gonna get all sappy like that and tell them 😉 I took them to our usual hot-pot restaurant the other day. I don’t know what took me so long to blog about this place. 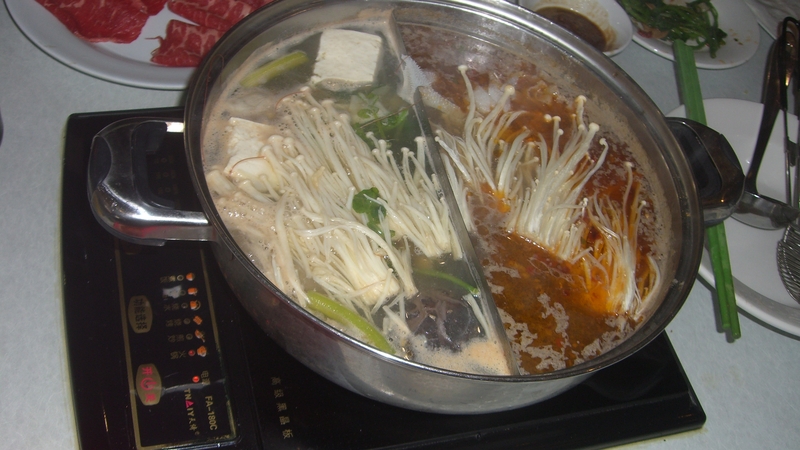 It’s called Kings Noodle And Hot Pot. Here’s the menu. 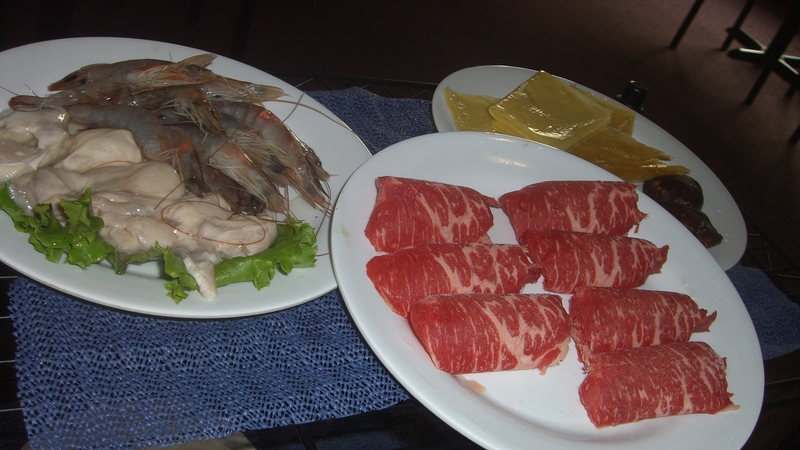 It’s all you can eat hot-pot buffet for $21.99. What I love about this place is their wide selection of food. 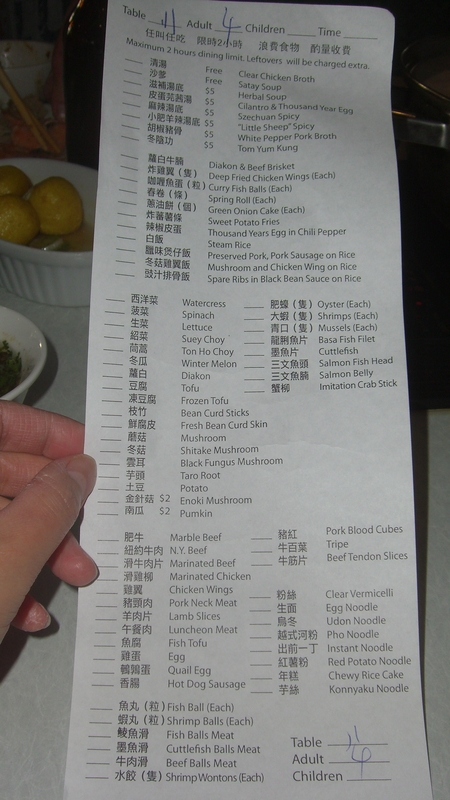 From different types of broth, to seafood, noodles, veggies, and meat. You just check off which items you want and your dishes come out on a cart like this. 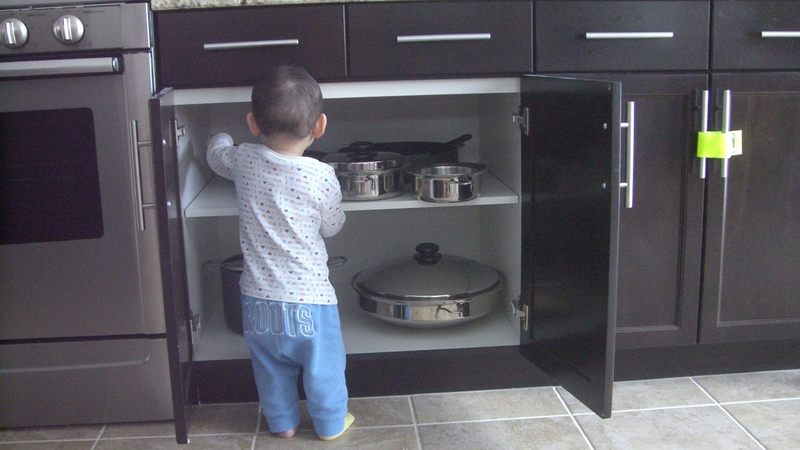 And they have a variety of cooked foods as well, which I love cause if the kids get hungry I can let them munch on those while the raw food isbeing cooked. 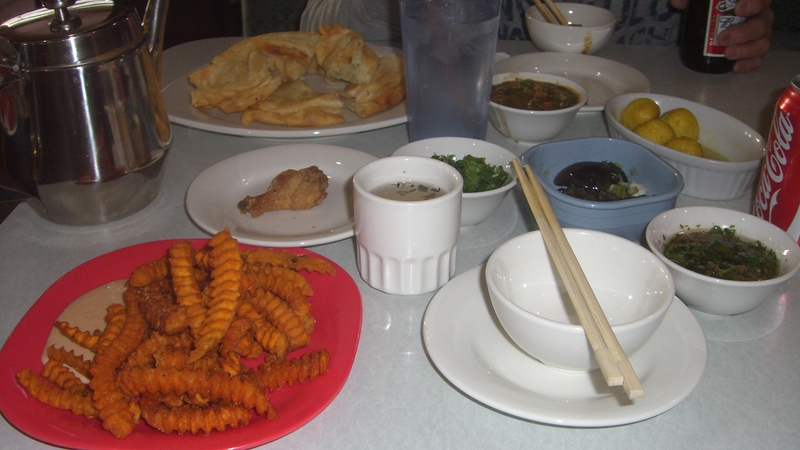 Our favorite cooked dishes are the sweet potato fries, green onion cakes, curry fish balls, and deep-fried chicken wings. If you’re in Edmonton and looking for a good hot-pot restaurant, I’d highly recommend this place. We probably eat here at least two to three times a month. I always try to spend as much time as I can with my family on the weekends but somehow I always end up on the computer blogging. Like pop, I think this has quickly become an addiction for me. Anyways, here’s what else I did this weekend. 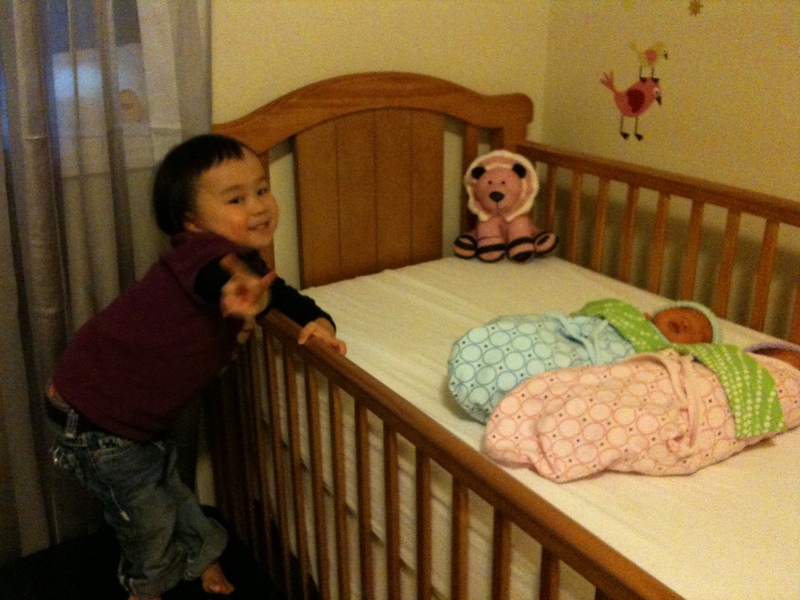 We thought we’d use the extra time to finally promote Kayla from this sleeping arrangement into a big girl bed. 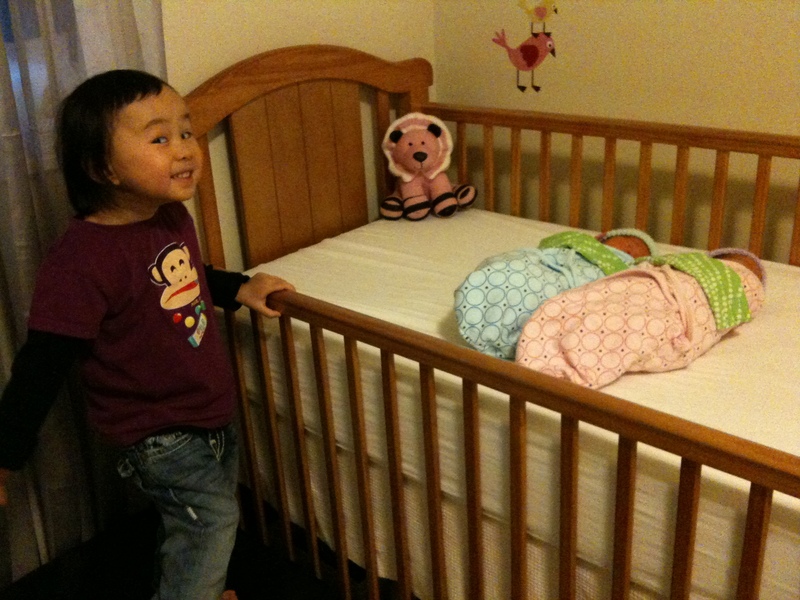 We didn’t want to start her off with too high a bed in case she rolled off then it would be such a high fall. 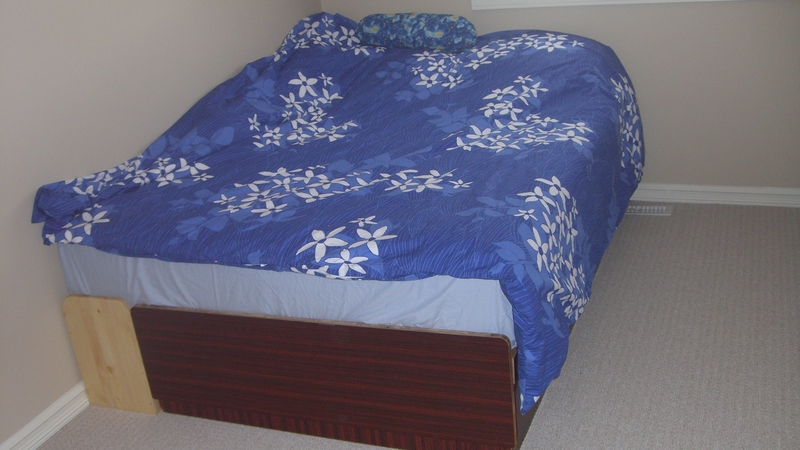 This is an old single bed frame we had lying around the house. 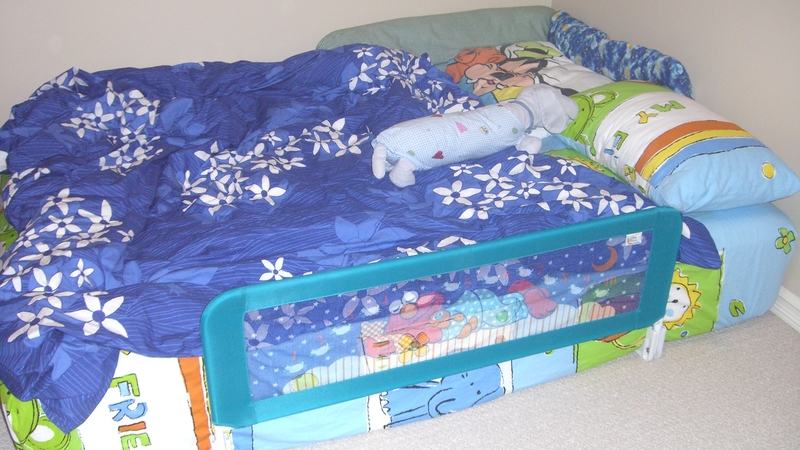 Being the cheap arse that I am, I didn’t want to throw it away but I didn’t want to waste the money buying a new bed frame either. 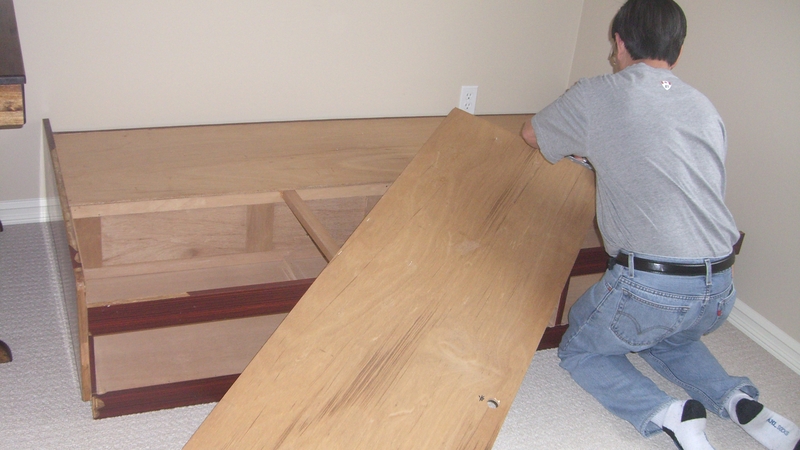 So my Daddio kindly offered to make an extension to widen the bed frame for Kayla. 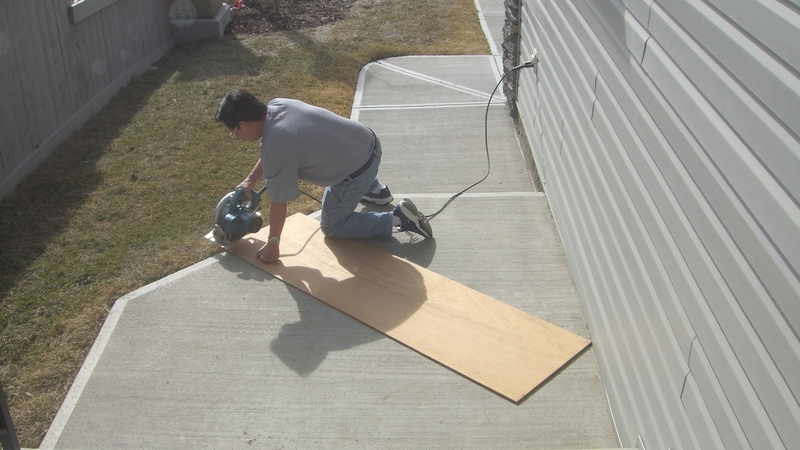 This was a simple task for him since he renovated half his own house into a salon for my Mom. 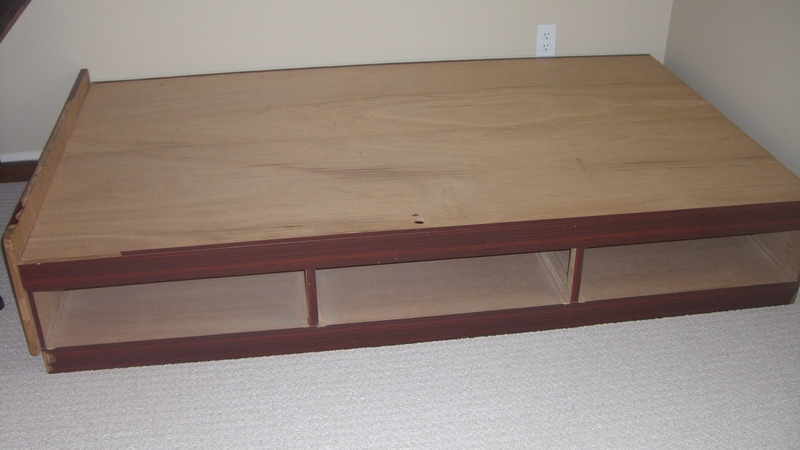 I took out the drawers on the bottom and off to work my dad went. 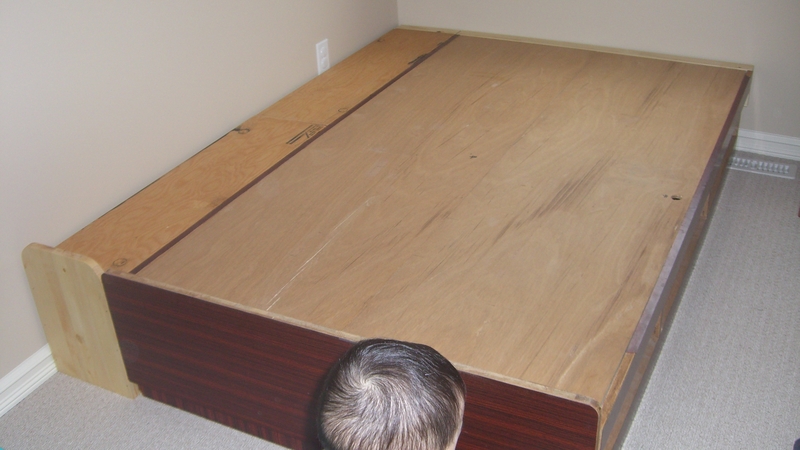 Long story short, and about an hour later, Kayla had a new bed frame. 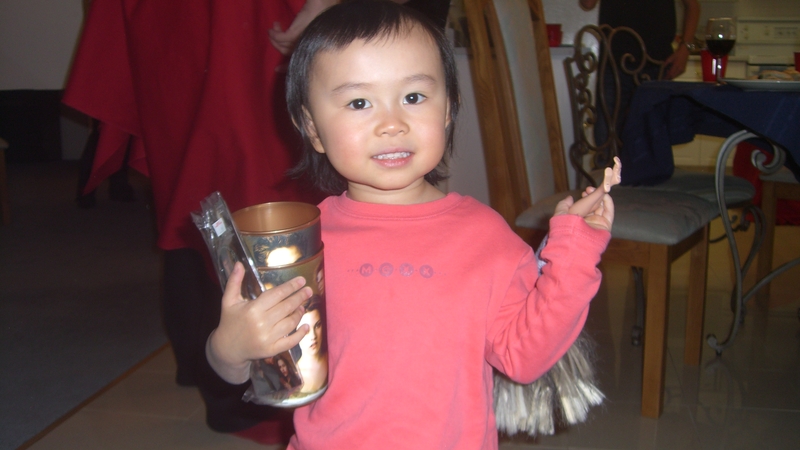 You can see the extension on the left side (and my son’s lovely round head haha). So there are the highlights of my weekend. I know, not all that exciting. Hope you’re having an exciting weekend! Until next time friends and family. My Dad came to pick up the kiddies and I today to spend a day at their house. When I looked outside, I wasn’t impressed. 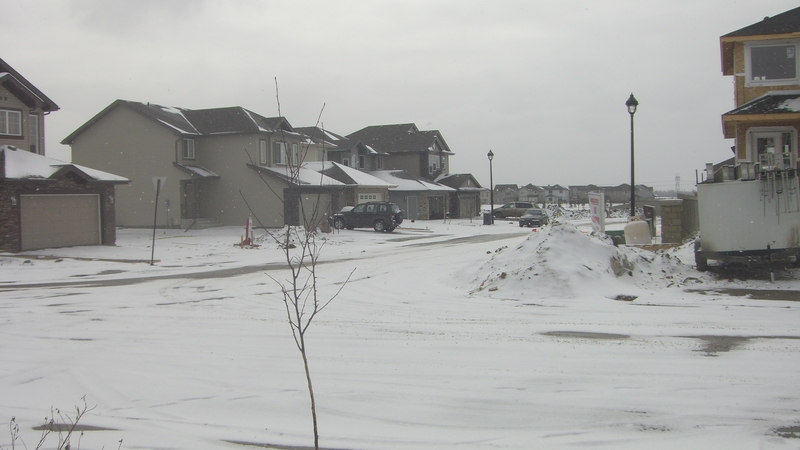 Just when I thought I could take my kiddies to the park soon cause all the snow had melted, old man winter decided to drop by again…grrr. 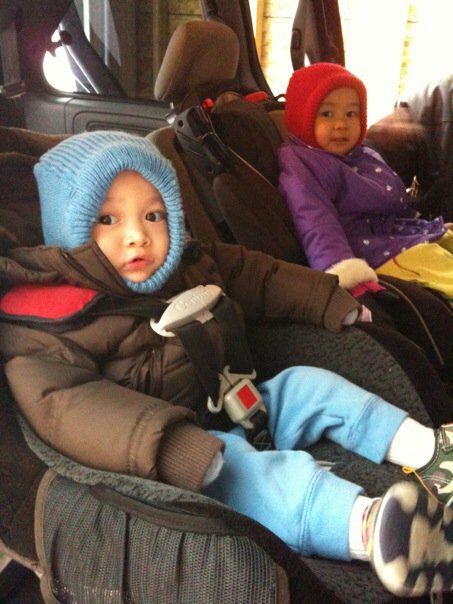 So out came the winter jackets and head-gear, into the van went the kiddies, and off to Grandma and Grandpa’s we went. Now that I look at this picture, I realize I must be challenged at colour coordinating. 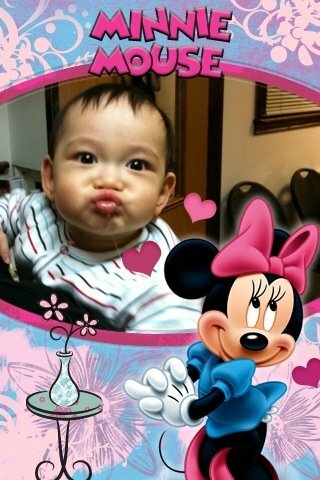 My poor daughter…haha. Not only do the kids love going to my parents’ house but so do I cause there’s always free food, and who doesn’t love free food? My Mom made some siu mai for us. This is the only pork meat I’ll eat. She makes them extra lean for me. 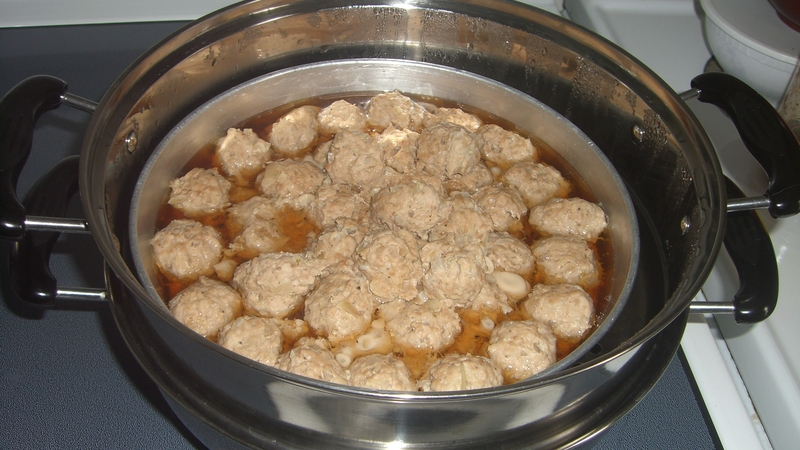 These are nothing like the dim sum ones, they’re more like pork meatballs. 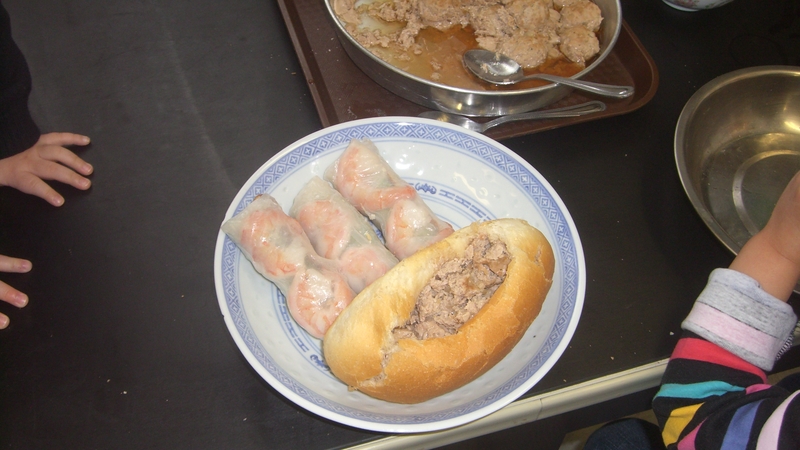 I stuffed them into a baguette and made a siu mai sub. She also made shrimp salad rolls. 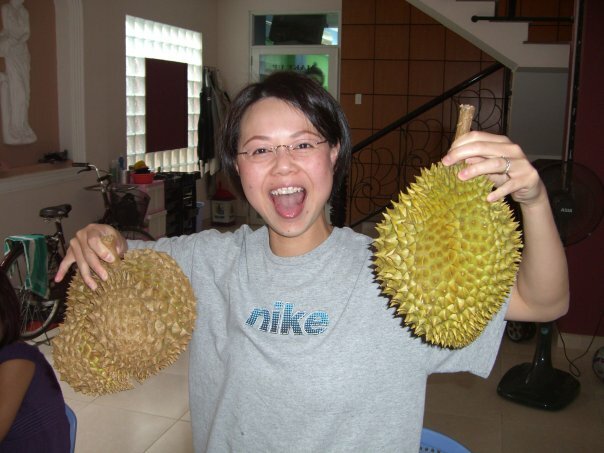 These are usually stuffed with slices of fatty pork meat but she knows to leave those out for me. It’s not so much that I’m worried about the fat, it’s more the chewyness and texture of the pork skin that deters me. 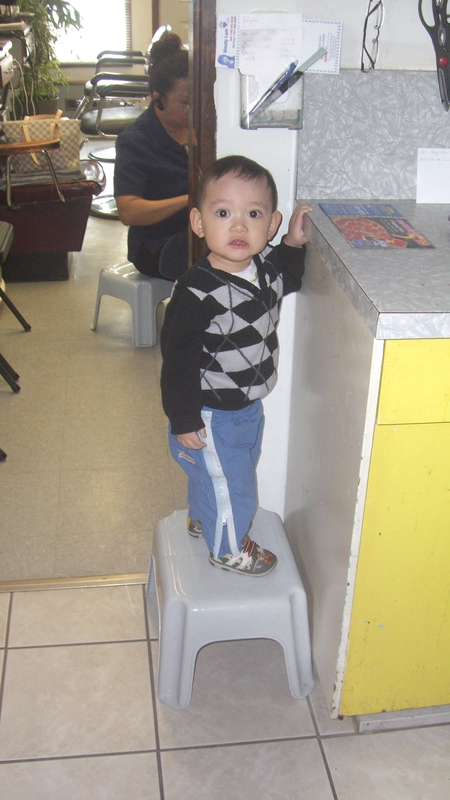 Of course while I was having lunch, someone continued getting into trouble. If you’re wondering what’s happening in the background, that’s my Mom doing a pedicure on a client. My parents turned half of their house into a salon. 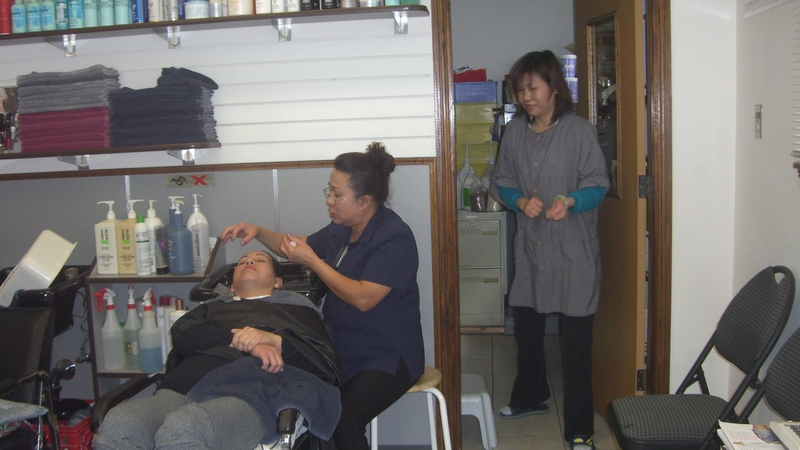 This is her doing threading on a client. I’m not even going to attempt to explain what that is so I just linked it. If you look closely you’ll be able to see the string. Any of you ever tried this before? Definitely one of the coolest but strangest hair removal techniques I’ve seen. Whenever we go to my parents’ house we usually stay for dinner as well. 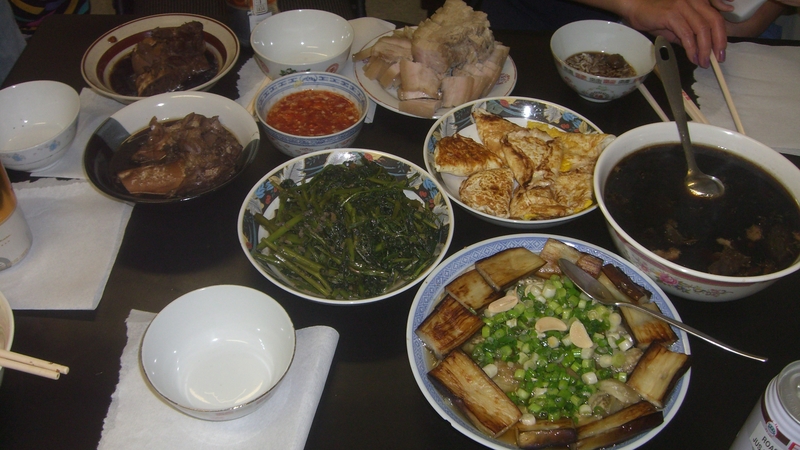 Tonight we had oven roasted eggplants topped with green onions and some fish sauce, stir-fried ong choy (definitely one of my favorite Chinese dishes), pan-fried eggs, pork meat, and some kind of Chinese herbal soup. The lovely ladies at Why Deprive and Lucky Taste Buds are having a giveaway. Check them out quick, may be ending soon. I’m not going to talk much about food or my kiddies today but more on blogging. It was quite interesting reading your comments on the New Moon post. At first I wasn’t sure if I wanted to post it but now I’m glad I did. I appreciated and enjoyed reading your honest opinions and comments. I hesitated about posting it because I didn’t love the movie (and books) like a lot of people did. But I didn’t hate it either so I’m sorta in the middle. I know how much some people (particularly one person) did love this movie and I didn’t want to do a bad job writing a post on it and ruining it for them. And frankly, I was also afraid of starting a war in my comments box haha. After contemplating for a day I came to the conclusion that no matter what I write about, I’m never going to please everybody. Some people are going to like it, some people are going to dislike it, and some people may not have a clue as to what I’m talking about anyways. As somewhat of a new blogger I have to remind myself that blogging should be about anything I want without having to worry that my readers will hate it. It shouldn’t be about making up stories and going with the flow trying to get as many readers as possible. Although getting comments and making many new friends are nice bonuses. Blogging should really be for myself, to relieve stress, to talk about my honest thoughts and opinions, and to enjoy a new hobby. 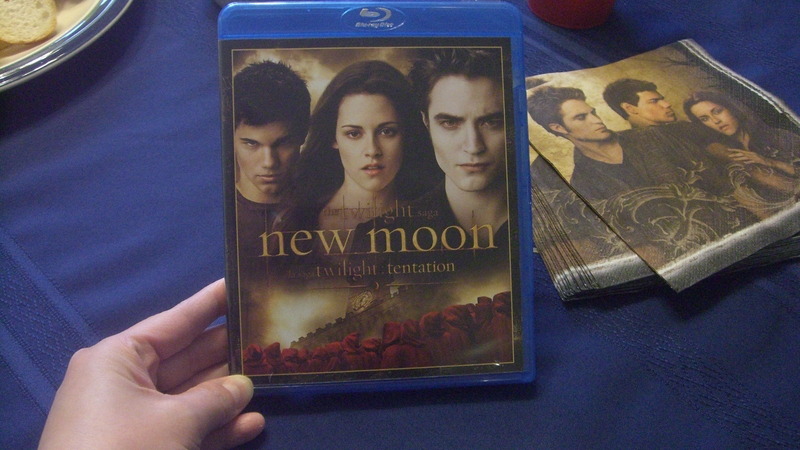 So with that in mind I decided to blog about New Moon not caring if people were going to hate it or love it. Even though I’m not a big fan, I did have a great time with my friends (who threw an awesome party), my hubby and daughter, and had yummy food, so I think that’s definitely worthy of a post. So with that said, I’d like to thank you for all your honest comments on my blog. Not just that but also for allowing me to follow your blogs and escape this hectic life of a mother and live life through your eyes for a while. I’d also like to thank those friends and family who do read but don’t comment. It means a lot to me that you’re taking the time out of your busy lives to get to know a little bit of mine. Gosh I felt like I was one of those actors/artists accepting an award after saying that. Again, only in the blogging world am I able to dream like that haha. Sorry, back to what I was saying. I’m still trying to figure out for myself if the blogging world and the real world can exist as one. What I mean by that is if I’m willing to announce my blog to ALL my friends and family yet cause so far I’ve only told a few close friends and very few family members. I guess I’ve rambled on enough for today so I’ll leave you with this thought. Do you think the blogging world and the real world can coexist “publicly”? If so, what made you want to share your blog with ALL your friends and family? 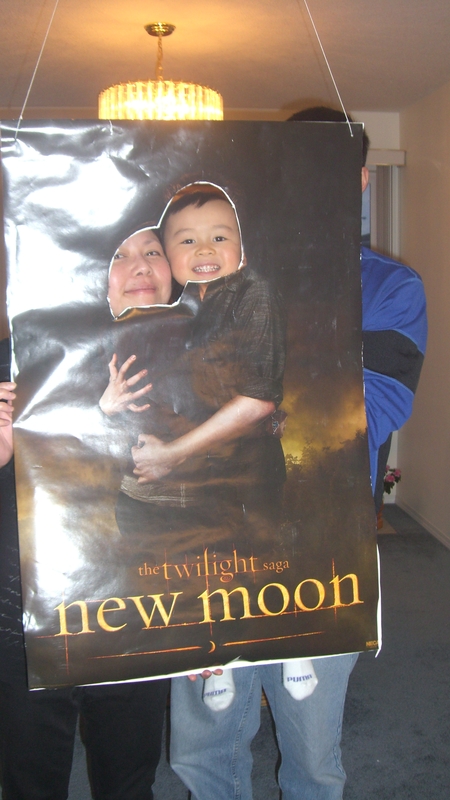 Yup yup, a New Moon party. 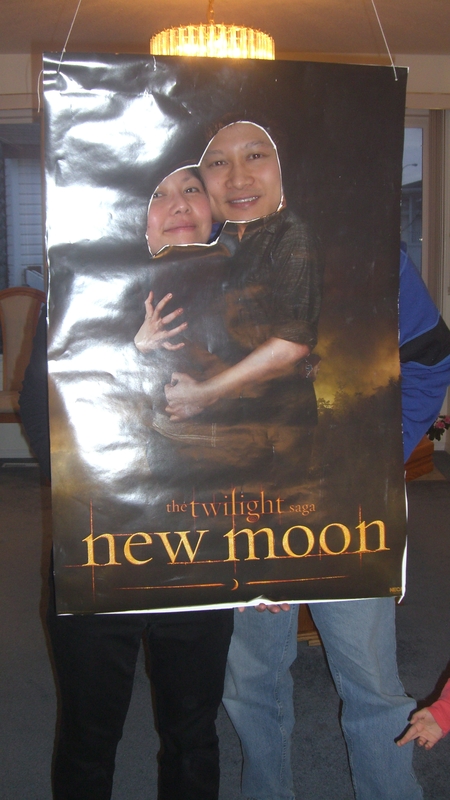 My best friend’s sister and her family hosted a New Moon party and were kind enough to invite us. I’m choosing to keep the names and pictures of everyone who attended this party out of this post to respect their privacy. I’m sure you’ll understand. We dropped off B with my parents and brought A. So we started out with a lovely spread of veggies, bread and dip, pistachio nuts, and some spinach stuffed pastry. 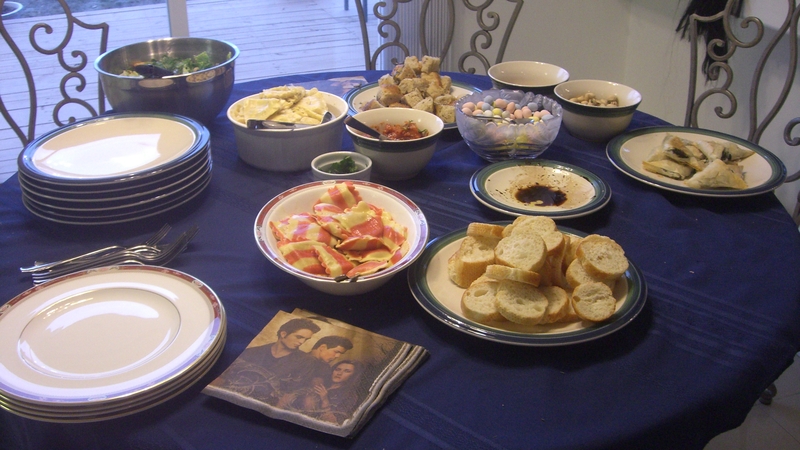 Dinner consisted of ceasar salad, ravioli stuffed with cheese and another one stuffed with butternut squash, and some more bread and dip. I had to try a bit of everything of course. I loved how pretty the butternut squash ravioli looked. They’re the striped ones at the bottom of the plate. I could definitely eat these plain with no sauce and they would satisfy my taste buds. They had a hint of sweetness (as butternut squash tends to have) to them and tasted exactly to my liking. The host said she got them from Costco if any of you are wondering. Then we put on the movie with some popcorn, Twizzlers, and Reese’s peanut butter cups. Yes, after all that we still had dessert! 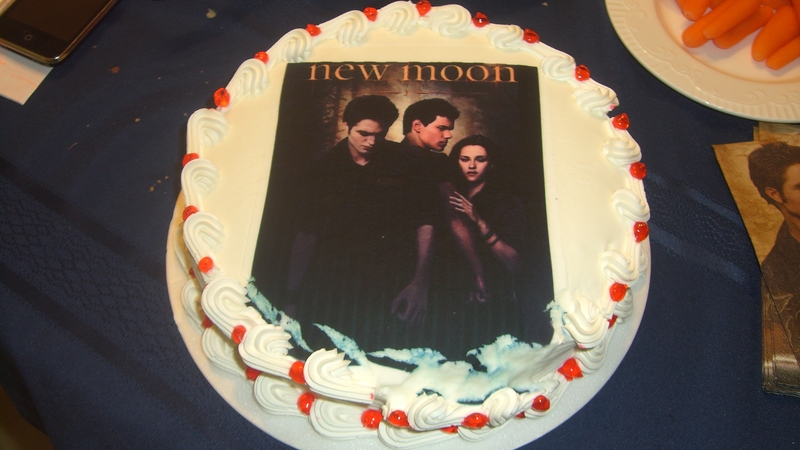 A New Moon ice cream cake from DQ. The top of the cake melted a bit while driving home but luckily was saved in time. Good save girl! I’d have to say that out of the four books I disliked this one the most. I was struggling to finish it. If it weren’t for my best friend constantly harassing me to finish the book, I don’t think I would’ve gotten through it. I know she’s reading this so yes dear I categorize being called 10 times a day on my phone to check which part I’m at HARASSMENT. But you know I luvs ya girl 😀 I liked the movie much much better than the book. 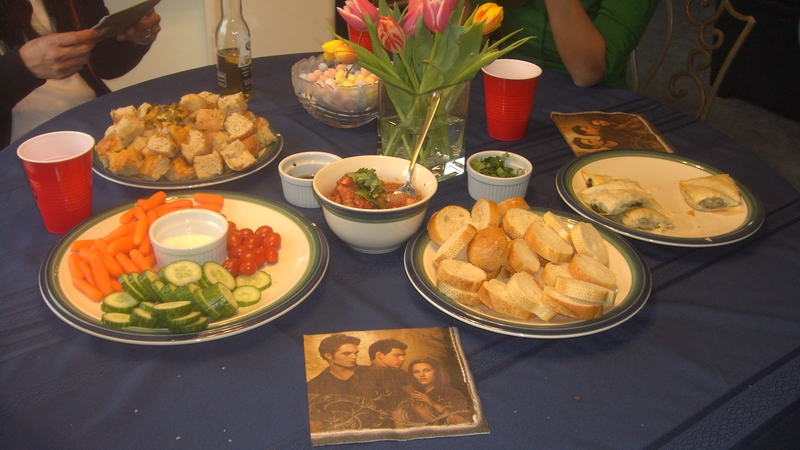 Any of you crazy twilight fans like my best friend and her sisters? 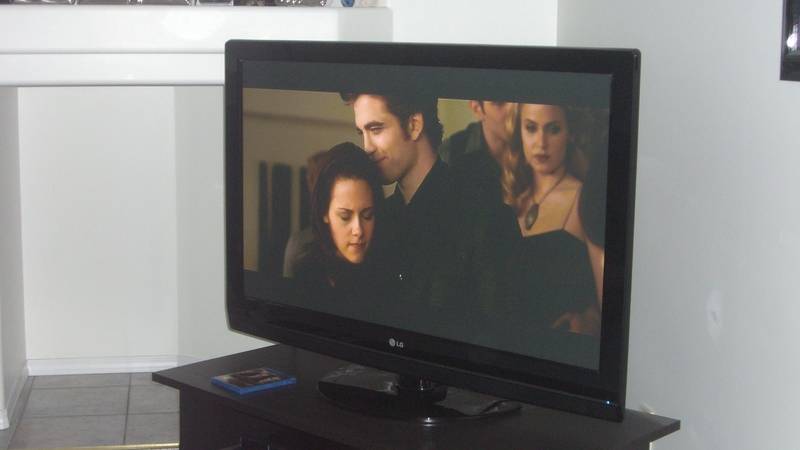 What did you think of New Moon? We were supposed to go to Vancouver this weekend to visit my in-laws but pushed it to next weekend just to attend this party. It was well worth it! Thank you to my best friend’s sister and her family for hosting this wonderful party and inviting us. Once again, great friends, great food, great times! Another great weekend wouldn’t cha say? I hope you’re having a wonderful weekend. Until next time y’all. Lucky Taste Buds is having another giveaway. Go check it out. This week flew by super fast! I’ve been meaning to post this earlier but I just haven’t had the time. With more daylight out and warmer weather I just want to spend as much time out of the house with the kids as possible rather than having them cooped up at home all day. 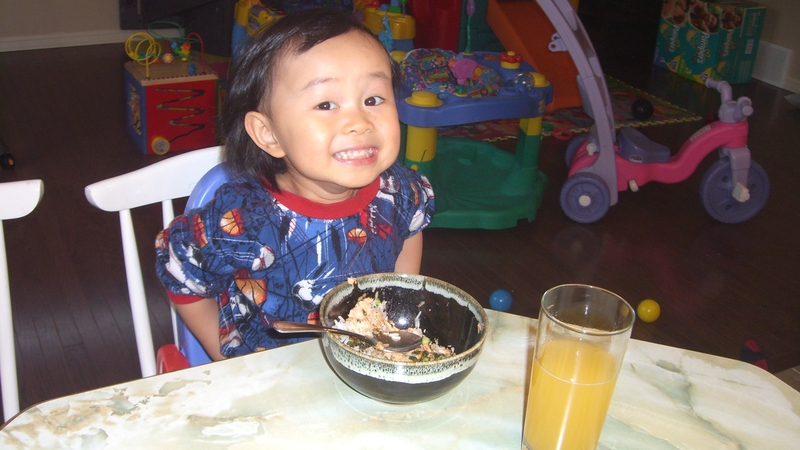 Speaking of kids, since this is afterall the MOMoirs of a food enthusiast, I thought I should post some baby and mommy pics up. 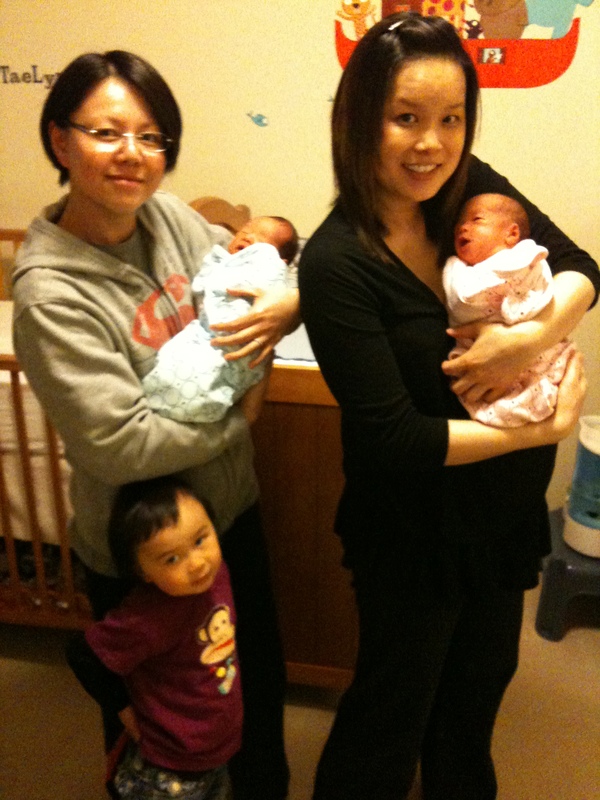 My friend Nancy and I decided to visit a friend of ours who just had TWINS! How exciting (and exhausting) is that eh? 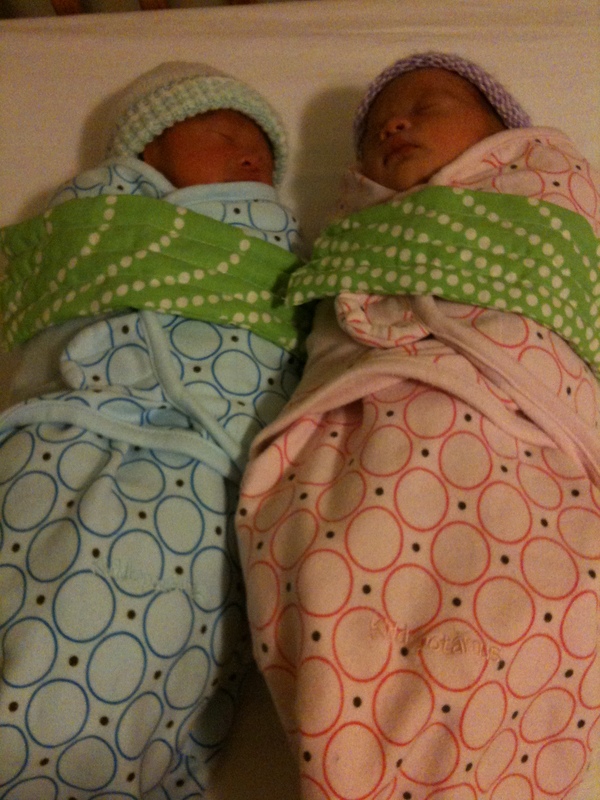 Here are the two lovely bundles of joy. A boy and a girl! This is the beautiful Taelyn. Exactly a week old when we visited. I had to take this next picture to show you how adorably (is that a word? 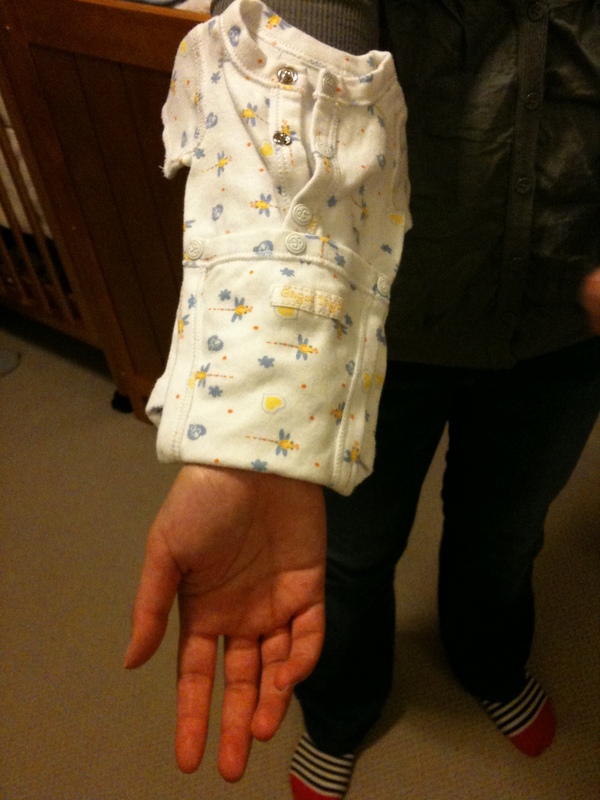 teehee) small their preemie clothes are. Only about the size of one’s hand. Is that cute or what? Yes Kayla, we know there are two babies. The happy (LUCKY) mommy and I.
Nancy (left), Sandy (middle), and myself. Oh and did I mention we fought through driving in 5:00 traffic for an hour just to visit these beautiful twins and their Mommy and Daddy? Needless to say, I’m sure Nancy and I agree it was well worth it. 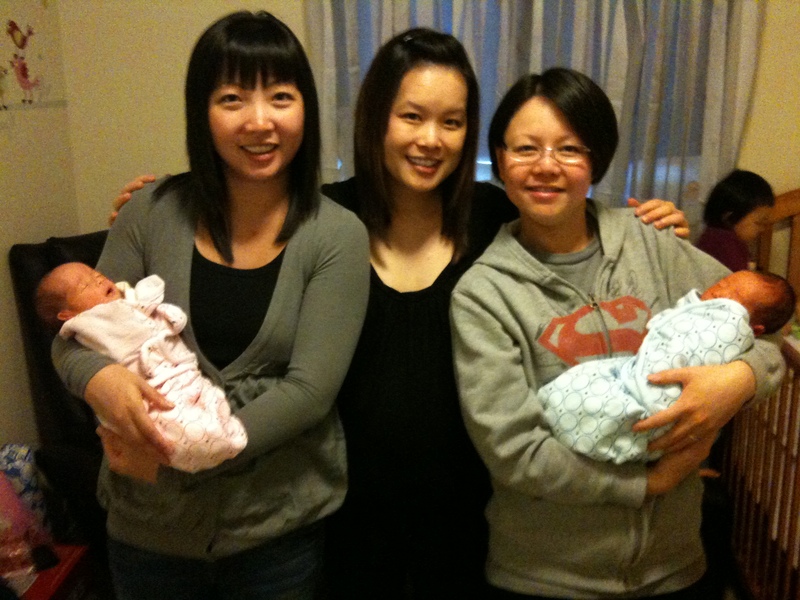 So a huge CONGRATS to my friends Sandy and Tat for giving birth to two beautiful, healthy bundles of joy. You’ll definitely have double the work, double the trouble, double the headaches. But the best part is that you’ll also have double the love and double the fun. In my books that’s priceless! Welcome to the wonderful journey of motherhood hun! God bless you and your beautiful new family.